I’ve never felt such a motherly frustration as I have the past two weeks. Our daughter has had a mysterious sickness and has had no appetite. My normal amazing eater wanting nothing but grapes and berries….and I wanting nothing more than for her to eat. Anything. 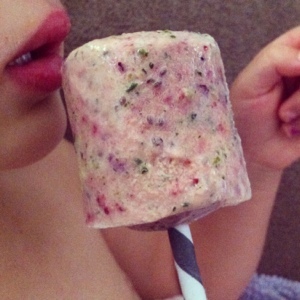 I’ll spare you of my motherly woos, and tell you of a saving grace…Get Well Popsicles!! A blend of plain Greek yogurt, berries, coconut water, chia seeds, garden kale, and veggie powder.